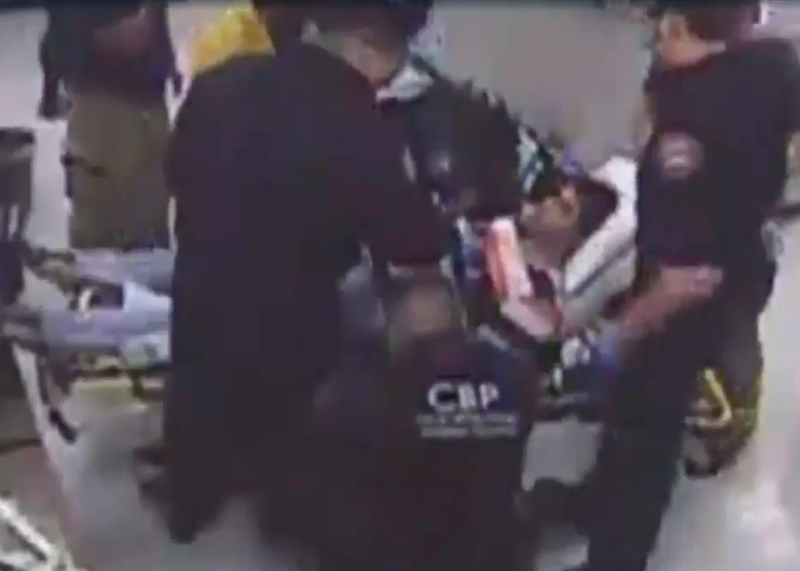 Newly released surveillance video shows a teenager drinking liquid methamphetamine, which he claimed was juice to US Customs and Border Protection agents, shortly before he convulsed and died from the drug. The teen's family believe he was coerced by the agents to drink the deadly substance. Cruz Marcelino Velazquez Acevedo, 16, from Tijuana, was trying to enter the US at the San Ysidro Port of Entry near San Diego on Nov. 18, 2013, when customs officers asked him about two drink bottles of an amber-colored liquid in his backpack. Velazquez Acevedo told the officers the bottles contained apple juice. Officers didn't believe him and did an initial test on the liquid, but one that is not effective at revealing liquid methamphetamine. At a secondary inspection site area, Velazquez Acevedo sipped the liquid in an effort to prove it was juice. The new video, released by Velazquez Acevedo's family via their lawyer Eugene Iredale, shows the teen, wearing a white hoodie, pick up one of the bottles and sip it. He took four sips of the liquid in total. The bottles contained liquid methamphetamine, a highly toxic form of the illegal drug that has been on the rise because it's easier to traffic as a liquid, which is what Velazquez Acevedo was trying to do. Officers suspected the bottles contained liquid methamphetamine, but encouraged him to drink it regardless, resulting in his death, argues Iredale. 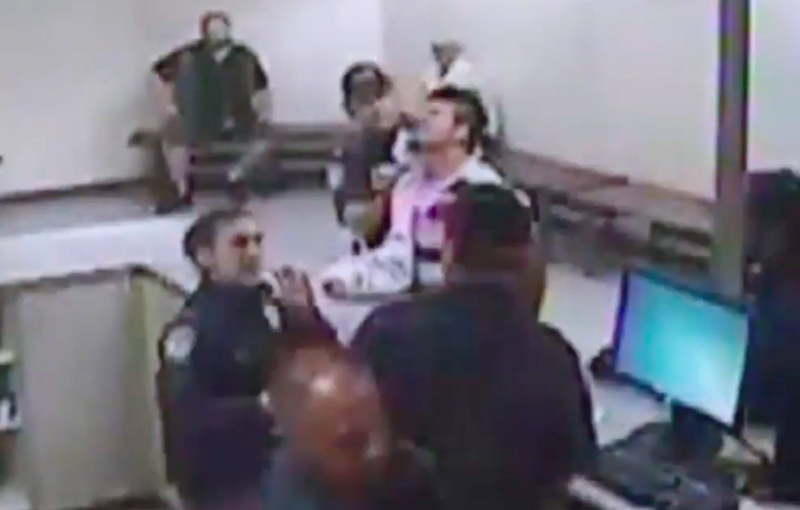 In the video, the officers appear unconcerned that Velazquez Acevedo is drinking the liquid in front of them, smiling at each other and chatting. "It's true that Cruz was doing something that was against the law. And that he did not have to be doing. That's a fact," Iredale told NBC. "It's also true that they did not point their guns at him or physically threaten him but in a social context in which this occurred, they knew exactly what they were doing." Shortly after ingesting the liquid, Velazquez Acevedo began sweating and screaming in pain, before convulsing and shouting the words "mi corazon" [my heart] repeatedly, according to a lawsuit filed by the family in a Californian federal court. The lawsuit argued that rather than immediately seeking out medical attention after agents suspected the teen had ingested drugs, border officials placed him in custody. He was later taken to the hospital and died a few hours later. His family settled the lawsuit against Customs and Border Protection for $1 million back in March. The San Diego County’s Medical Examiner’s Office ruled his death accidental. Rep. Zoe Lofgren, a Californian Democrat and member of the House Subcommittee on Immigration and Border Security, told ABC News on Saturday she believes the actions of the agents resulted in his death. "Drug smuggling is wrong and is a crime, but this teenage boy did not deserve a death sentence," she said. "For CBP officers to inflict a summary death sentence is not only immoral, but also illegal." The US Customs and Border Protection told BuzzFeed News it conducted a nearly yearlong review of the incident that determined in September 2014 "that no further action was warranted and the officers involved were not disciplined." The San Diego Police Department also investigated the death in 2014, and the US Attorneys Office declined to press charges against the officers involved. The officers in the video work for the US Customs and Border Protection agency. An earlier version of this post misstated the agency.